Home » News » Symptom or Cause? More often than not a clutch change is a difficult and dirty job that requires a day of downtime, so when presented with a vehicle in need of clutch replacement it is imperative that a full assessment or diagnosis takes place to ensure that a worn clutch is not just the symptom of another vehicle related problem. If pre-existing faults are not identified and eliminated a newly fitted clutch could fail early or even not function at all. The following is a guide to maximising the opportunity of the vehicle being off-road by fitting an LuK OE clutch and making sure it is able to perform to its full potential and give the superior length of service life that the clutch was designed to provide. Much can be learned from this simple step, ask about the symptoms leading up to the failure, especially if the clutch has failed earlier than expected – consider how many miles the worn clutch has covered and the type of work the vehicle carries out. A regular complaint is that the clutch is heavy or is crunching while changing gears. Before changing the clutch, check the hydraulic system, if this is not working at full pressure the release bearing will not travel far enough to disengage the clutch fully, even though the pedal appears to be at full travel. Make sure that there is no fault with the clutch master/slave cylinder, renew or test hydraulic fluid, check flexible hose for degradation, leaks or kinks – a problem not spotted with any of these could lead to an unnecessary clutch change. In a car with high mileage it is possible that the cross shaft support bushes or alternatively the ball and pivot on the release arm are worn – it cannot be underestimated how important these small, seemingly insignificant components are. A small amount of wear can lead to a heavy clutch pedal while severe wear could make it impossible to disengage the clutch. A new clutch often requires more bearing travel to disengage, it is sometimes assumed that because the new clutch won’t clear there is a fault with it – the fault could actually be due to wear in the release fork assembly, as previously mentioned. 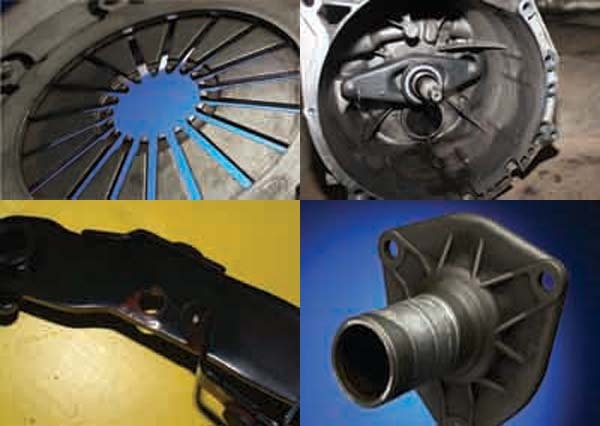 Examine wear patterns on the old clutch diaphragm fingers or levers, an off-centre or deep wear pattern could indicate bearing mis-alignment due to wear in the release fork assembly. The guide tube or gearbox snout is important because, if worn, it can cause a stiff or notchy clutch feel – in severe cases it can prevent the clutch from clearing at all. If damage or heavy wear is present it must be replaced or re-sleeved as appropriate. Many clutch failures are attributed to bearing failure. This could be the result of incorrect release mechanism adjustment giving too much pre-load between the release bearing and clutch. A likely causal scenario of bearing failure is that wear in the clutch fork assembly or guide tube makes it necessary for the clutch to be over adjusted in order to get it to clear. This over adjustment can lead to loss of pedal freeplay and constant excessive load on the bearing causing loss of lubrication and then failure, in severe cases if the bearing breaks apart, it can then damage the clutch and bell housing. Before fitting the new clutch always ensure that any previous adjustment in the release mechanism is reversed. Check the clutch pedal isn’t bent or distorted and that its pivot is good, also that the manufacturer’s recommended amount of freeplay is present. If fitted, ensure that the pedal stop is present; an absent stop could lead to overstroking possibly damaging the slave cylinder and clutch. Before removing the gearbox ascertain that any fault such as dragging or noise is correctly attributed to the clutch as gearbox faults can also give similar symptoms. This is important because the car may be re-assembled with the new clutch only to find the problem still exists. Check gearbox oil, – spent oil loses its viscosity. Check the first motion shaft for excessive play, if in doubt, consult a gearbox specialist. If gearbox oil is present on the old clutch, check the input shaft seal for leaks. To prevent gearbox misalignment ensure that all gearbox alignment dowels are present. The face of the flywheel transmits the engine torque to the clutch, it is therefore critical that this face is in tip top condition. Indeed if it is worn more than is acceptable it will reduce the life of the new clutch and could also give poor clutch engagement. Signs of flywheel wear include heavy scoring to the friction surface, an uneven surface, blue or brown tempering, glazing or a mirror finish to the surface. If the flywheel is recessed ensure that the depth of the recess is correct to manufacturer’s specification. Check and replace flywheel pilot bearing if necessary. A badly tuned engine can introduce excessive vibration to the driven plate damper assembly or Dual Mass Flywheel, resulting in damage such as spring break out or total damper collapse – if not corrected this will damage the new clutch driven plate. Poor running or starting issues will shorten the life of a dual mass flywheel. It’s important to check the rotational freeplay and rock as well as normal flywheel visual checks to ascertain whether it needs replacing or not. The LuK DMF special tool has been specially designed to do this and full instructions are included as well as the DMF data for every LuK DMF. If there are signs of engine oil in the bell housing, check the crankshaft oil seal.